Preheat the oven to 300 degrees with the rack in the middle position. Cut the roast crosswise into quarters (remove the line of gristle) to make 8 steaks. Pat the steaks dry with a paper towel and then salt and pepper them. Heat 1 T of oil in a dutch oven over med-high heat. Brown 4 steaks at a time, 3 minutes per side. Add onion to the empty pot and cook until softened (5 minutes). Add the tomato paste, flour, garlic, and thyme. Cook 1 minute. Stir in diced tomatoes and broth and bring to a boil. Return steaks and any juices to the pan. Transfer to the oven and bake for 2 hours, until the steaks are fork tender. Transfer steaks to a platter, cover with foil, and let rest 5 minutes. Skim the fat from the sauce, stir in the parsley, salt and pepper to taste. Pour over steaks and serve. 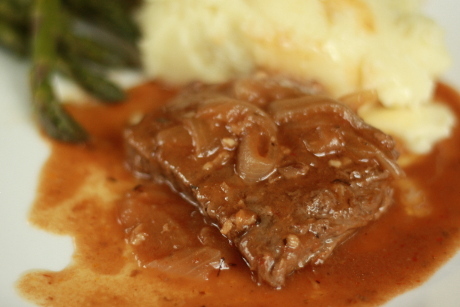 One Response to "Gluten Free Swiss Steak"
Love the Swiss steak recipe. Thanks so much!!! !